There is no better way one to get element selenium than to eat Brazil nuts. 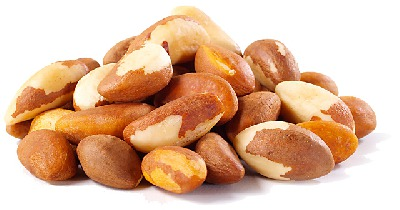 Two nuts a day provide the right amount of "microelement of long life" known as selenium. They are one of the best antioxidants among nuts and seeds. Selenium has a very strong antioxidant properties, it fights free radicals, which are main causes of cells aging. This is one of the nuts of highest protein content. It has a strong anti-inflammatory and regenerative effect. In the chemical composition of this fruit from Amazon forests are also: vitamins C, B6 and E, omega-3 and omega-6 fatty acids, for which it is certain that reduce the risk of cardiovascular diseases. Because of fiber and protein contained in it, Brazilian walnut is used to control hunger. It lowers cholesterol and blood sugar. Brazil nut stimulates the production of testosterone in the male body. Nutrition facts for 100 g.